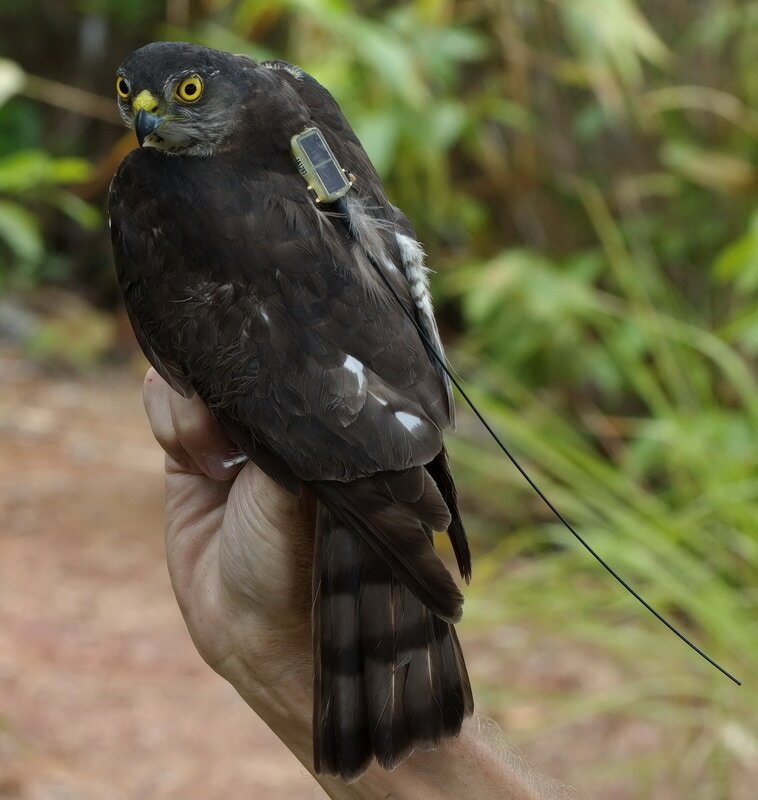 The movements of three Japanese Sparrowhawk Accipiter gularis and two Chinese Sparrowhawks A. soloensis fitted with solar-powered satellite tags at Khao Dinsor, Chumphon. Raptors are at the apex of the food chain and are therefore important indicators of the state of the environment. Many species are threatened due to habitat loss and fragmentation. Determining their breeding grounds, migratory routes, and wintering sites is therefore essential for their conservation. Several hundred thousand raptors migrate annually from their temperate breeding areas passing through Thailand to largely unknown wintering grounds in Malaysia or Indonesia. Khao Dinso, (Pencil Hill) on the coast of Chumphon province of southern Thailand, is the best site in Southeast Asia for monitoring the southward migration of raptors. Building on information gained from several years of raptor counts and ringing, we have now started a program of satellite tagging to obtain more information on the movements to and from their breeding grounds and how they spend their non-breeding season. In September 2016 three Japanese and two Chinese Sparrowhawks were fitted with 5 g satellite tags. Of the Japanese Sparrowhawks one flew down the east of the peninsular before crossing to Borneo where she settled in an area dominated by secondary growth Acacia trees. The second reached a latitude level with Kuala Lumpur near the East coast; no signals have been received since mid-October. The third flew down the west side of the peninsula and crossed over into Sumatra and on to Bangka Island. 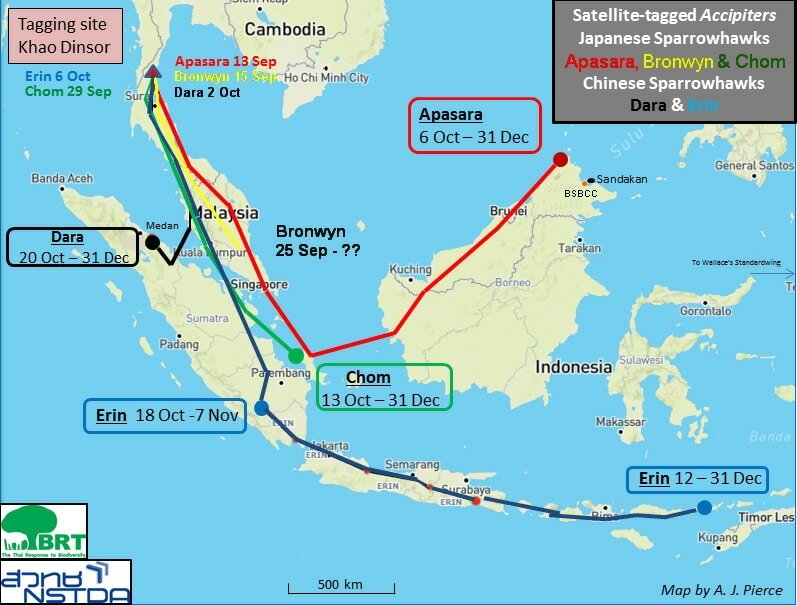 Both Chinese Sparrowhawks were tracked down the peninsula and across to Sumatra in stages of over 300 km per day.. The first has settled near Medan in an area dominated by mature oil palm and rubber plantations. The second bird stopped in southern Sumatra for nearly three weeks before continuing East with short daytime flights before settling on Adunara Island just East of Flores.